Seven Night Minimum, NO EXCEPTIONS. Max Occupancy: 6 (NO MATTER THE AGE) This is a regulation set by The City of Marathon that states 2 persons per bedroom plus 2. NO EXCEPTIONS. This updated, roomy house is in a great location! A single family home on stilts, it sits at the end of the street on a corner canal lot with 210 feet of 18 feet of deep water dockage. There is plenty of room for your boat, yacht, et skis or kayaks. Tiled floors, well-equipped modern kitchen with top of the line appliances and granite counter tops, two bedrooms and large living area, porch, internet, and updated bathrooms and centrally located in Marathon. Master bedroom has a king size bed and beautiful private bath with separate shower and claw tub. The guest bedroom has a queen size bed. Living room has a queen size sofa bed. There is also a futon that folds out to make a full size bed. Three flat screen TV's. A beautiful enclosed porch offers additional lounge area and eating area with views of the canal below. Fish cleaning station at 45 foot wooden dock with shore power. Great fishing right off the dock. It is within walking distance to grocery store, drug store, post office, restaurants, and one mile to beautiful Sombrero Beach. Check out the rays, manatees, and dolphins swimming by in the canal. Go bar hopping by boat. Easy ocean and gulf access. Go fishing or lay in the hammock. Relax and enjoy! This property features over 200ft dockage, so we will accept more than one boat but there will be additonal fees. The property at Coconut Corner was a real treat to visit. The house was clean and very updated. The beds were comfortable and all appliances worked as expected. We brought our 28ft center console boat with us, the property has two docks for mooring and the canals are very deep so no need to worry about tides. To navigate to the Bay or Atlantic there is a 15 - 20 min idle to open water but it's a scenic trip. There are three fuel docks, one bait house and four restaurants that you pass on your way out of Boot Key Harbor, all have boat parking. The staff at VRFK recommended the boat ramp at 33rd street, a free public ramp a few blocks from the property. The ramp was the best I've seen in the Keys and in our case was not busy at all (no wait) The house is located on a dead end with little room to turn around with a boat trailer but it really was not an issue at all. the street is very short so we just backed the boat trailer down the street and parked it in the driveway which provided plenty of parking for the trailer and our truck. We visit the Keys twice a year and usually stay in Big Pine, our trips center around boating, fishing and diving. This will be our new place to stay going forward. This location has so much to offer, a grocery store is 2 minutes away and a dive center is 2 minutes away to fill tanks. By boat you can go to four great restaurants all within the idle zone on your way out of Boot Key Harbor. The fuel dock offered 100lbs of ice free with at least a 15gallon fill-up and their bait was priced very reasonable. This is a great place to stay, especially if you're bringing a boat! We'll be back soon. 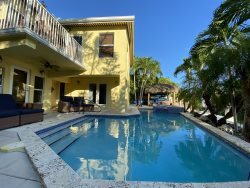 The staff at Vacation Rentals of the Florida Keys that we communicated with was wonderful. The provided us with a phone number and email if we had any questions. All of our questions were answered in minutes via email and the phone calls were answered immediately, very professional staff.